Fig. 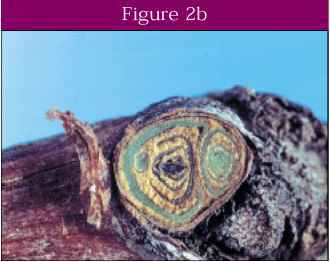 2b - The cross-section of a node indicating a dead primary bud in the middle with live secondary and tertiary buds on either side. need to be managed for the specific conditions of a vineyard. Even under the best of conditions, it is good management to replace trunks every 10 to 12 years in a temperate-climate vineyard. Many situations will require more frequent trunk replacement. Establishing new trunks is accomplished by first managing suckers, which are shoots that develop from below-ground or near the ground on trunks. (Some prefer to use the term "water sprout" for shoots that develop on the bases of trunks.) When a cane that has matured from a sucker is chosen to establish a new trunk, it is called a trunk renewal (Fig. 4). Suckers growing directly from the ground are preferred for trunk renewals on ungrafted vines. When they are not available, utilize canes originating on trunks as close to the ground as possible. On grafted vines, canes from suckers growing above the graft union must be utilized for trunk renewals. 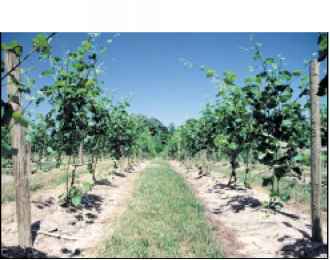 Grapevines grown in a temperate climate should typically be managed with two trunks because it is easier to combat the effects of winter injury to vines when each of two trunks services half of a vine space (Fig. 1d). Managing vines with up to four trunks per vine and with one or more of these trunks being replaced each year may be helpful when growing very cold-tender varieties (Fig. 4). 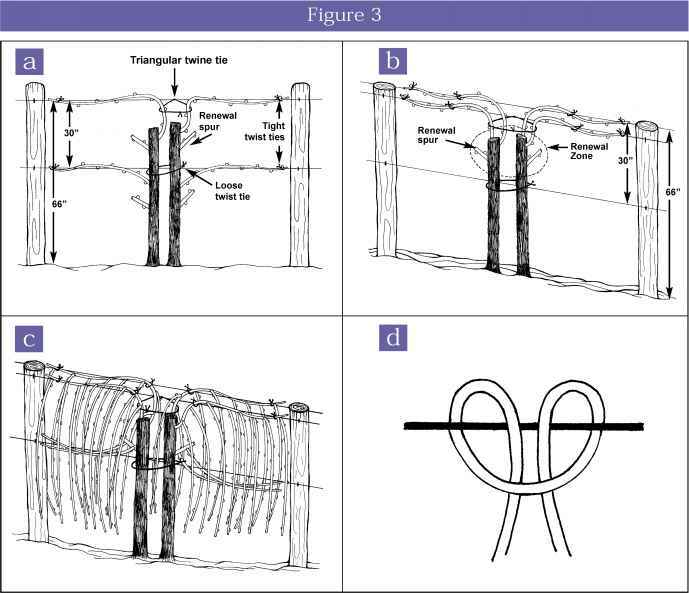 3 - Steps to training a grapevine to a modified 4-arm Kniffin training system: (a) traditional 4-arm Kniffin training system for fruiting canes tied on two wires at two heights on the trellis; (b) modified 4-arm Kniffin training with four fruiting canes tied on two wires at the same height (top) on the trellis; (c) vine at the end of the growing season that has been trained to modified 4-arm Kniffin training and shoot positioned during the growing season; (d) close-up of the double half-hitch knot used to attach the twine to the wire for the triangular tie. Fig. 4 - The fan training system uses multiple trunks (usually two to four) to distribute growth and crop over the vine space. 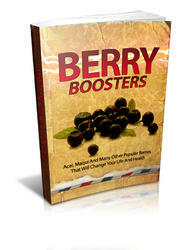 This training system is helpful to combat frequent winter injury. Grapevines are easy to grow and can live a very long time. Many productive commercial U.S. vineyards are more than a century old. The challenge to the table grape grower is not only to keep vines alive but also to produce quality fruit. Reaching that goal begins with the selection of a proper vineyard site. The commercial grower, who seeks profit, must undertake the selection of a vineyard site methodically by considering several site characteristics: macroclimate, microclimate, topography, soil physical and chemical characteristics, and cropping history. Reference materials (Zabadal and Andresen, 1997) are available to assist in that process. The hobby viticulturist is likely to choose a vineyard site on land already owned such as a backyard or by the family cottage. Within that limited framework of choice, the hobby viticulturist should still exert some discretion about where vines are planted. Vines need full sun, not only to promote fruit maturity but also to reduce disease pressure on vines. Avoid planting under shade trees or in the shade of buildings. Vines do best in well drained soils. They are vulnerable to spring freezes in low-lying frost pockets, so put vines on elevated ground whenever possible. Vines typically grow well over a range of soil acidity (pH) levels. Liming by commercial growers should aim for an optimum soil pH of 6.5. Hobby growers need to lime their soil only if soil pH is less than 5.5. Improve the internal drainage of heavy soils whenever possible. All other plant growth within several feet of a vine will compete with vines for nutrients and water so, whenever possible, establish vines with a minimum 4-foot-wide vegetation-free band under the vineyard trellis (Fig. 5). Eliminate weed growth on a vineyard site several weeks or even a year before planting through a combination of herbicide use and/or cover cropping. Attention given to these details can make the difference between having ugly, small, fruitless vines and attractive, large, orderly vines that produce enjoyable, quality fruit. Fig. 5 - Typical vineyard floor management with a minimum 4-foot-wide vegetation-free band under the trellis. Plant rows of vines, ideally in a north-south orientation, though any orientation that might be dictated by the site can produce quality fruit. Plant rows no closer together than the height of the trellis. For example, vines planted on a trellis 6 feet high should be at least 6 feet apart. Wider row spac-ings up to 9 feet will promote fruit quality. Vineyard row width is most often determined by the equipment (tractor or lawn mower) that will be used to manage the vineyard floor. Plant vines no closer than 7 feet apart. Wider spac-ings (8 to 9 feet) may improve fruit quality but may also reduce the yield of the vineyard. How do i plant grapes? What soil to use to grow grapes? How to grow table grapes? How to grow suckers from grape vine trunk? Which is better a two trunk sytem or a one trunk system on grape vines? 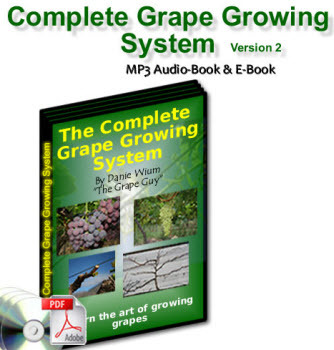 How to train grape vines? How to control sucker shoots on grafted grape? What are the shoots and suckers on grape vines? How to tie a grapevine to trellis?